Aurora Safari Camp is one of it’s kind in northern scandinavia. Founded and owned by Photographer Fredrik Broman. 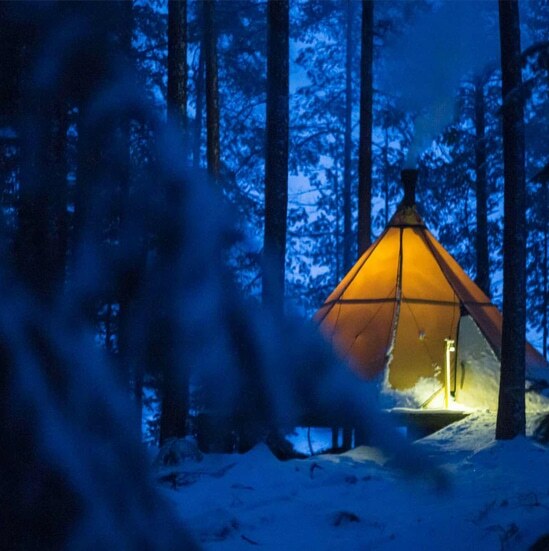 The camp is situated by the Råne River, in Swedish Lapland. There is no artificial light at all to be seen from the camp that disturbes your chances to see Aurora, and if we have clear skies the stargazing is just fantastic. Milkyway is right above our heads. We have 3 comfortable Lavvu Rooms that can be set as double, twin or family rooms. There is a firewood heater in each Lavvu, and even if very low outside temperatures, your room is warm on the inside. Tested with guests down to -37 celsius. Washroom is situated between 20-75 meters from the Lavvus. In the lounge you can have a drink by the fireplace or we can arrange fine dining for up to 14 people. By the open fireplace outside there is a magnificent view over the river. Just behind us we have a forest caped mountain and there is lot’s of moose in the forest, as well as red fox, reindeer, bears (hybernating in wintertime), roe deer and lot’s of birds. Tracks and signs are to be found even right next to your room. The Original Glamping team will book the camp only for you, your friends and/or family on private basis. Our guides are here to take care of you and keep you comfortable and/or active at all times.